This genus is accepted, and its native range is Indian Subcontinent to W. Malesia. Perennial. Culms erect; 100-150 cm long. Culm-internodes elliptical in section. Ligule a fringe of hairs. Inflorescence composed of racemes. Racemes borne along a central axis; in a multilateral false spike; spreading; oblong; unilateral. Rhachis deciduous from axis; subterete. 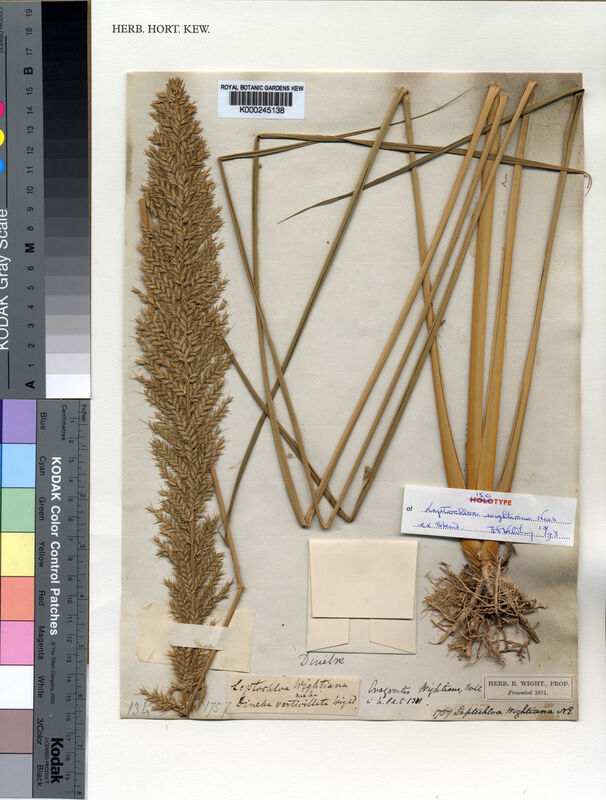 Spikelet packing broadside to rhachis. Spikelets ascending; solitary. Fertile spikelets pedicelled. Pedicels linear. Spikelets comprising 2-12 fertile florets; with diminished florets at the apex. Spikelets oblong; laterally compressed; 5-12 mm long; falling entire; deciduous with the pedicel. Glumes shorter than spikelet; gaping. Lower glume lanceolate; 0.7-1 length of upper glume; membranous; 1-keeled; 1 -veined. Lower glume lateral veins absent. Lower glume apex acuminate; awned. Upper glume lanceolate; 0.5-0.7 length of adjacent fertile lemma; membranous; 1-keeled; 1 -veined. Upper glume apex acuminate; awned. Fertile lemma ovate; laterally compressed; membranous; keeled; 3 -veined. Lemma lateral veins obscure. Lemma apex acute; mucronate. Palea 1 length of lemma; 2 -veined. Palea keels ciliolate. Palea apex entire. Apical sterile florets resembling fertile though underdeveloped. Lodicules 2; fleshy; truncate. Anthers 3. Stigmas 2. Caryopsis with adherent pericarp; ovoid; laterally compressed. Embryo 0.4 length of caryopsis. Myriostachya wightiana (Nees ex Steud.) Hook.f.